City Council voted on April 10 to adopt a major update to the Chicago Building Code that will better align the city’s construction requirements with up-to-date model codes and national standards. The new code represents the first comprehensive revisions to the building code in 70 years and will make construction in Chicago more affordable by expanding options to design and build with a wider range of materials and technologies. Chicago is now among the first major jurisdictions in the U.S. to adopt the 2018 International Building Code. Emanuel and the Department of Buildings introduced the ordinance at the March City Council meeting. 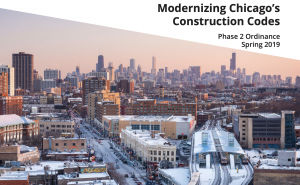 In addition to further streamlining the permit process, the new code will improve, enhance and spur on new building projects of all sizes throughout Chicago by adding more flexibility and options for construction materials. This can bring down the cost of new construction and building rehabs in Chicago including single-family homes, affordable housing units, and two- and three-flats. In being more closely aligned with model codes and national standards, the new code will speak the same language as building codes used virtually everywhere else in the country and promote greater use of green technologies and best practices for sustainable building design and construction. Though there have been several modifications to the Chicago Building Code over the years, the last comprehensive overhaul to the code was adopted in 1949. The code update approved today by City Council moves Chicago closer to national standards in several significant areas including building planning, fire and life safety, enclosures and materials, structural, small residential, and rehabilitation of existing buildings. Encourage preservation of Chicago’s existing building stock, including historic buildings, by providing additional flexibility and options for rehab work. This will bring down the cost of projects like the adaptive re-use of schools, retail buildings, and vacant buildings throughout the city. For more than a year, the Department of Buildings has worked closely with the Departments of Fire, Health, Planning and Development, and the Mayor’s Office for People with Disabilities along with more than 150 volunteer technical experts and industry leaders to review and refine several drafts of the Chicago Building Code. The proposed changes will be phased in gradually, beginning June 1 and completely replacing the current Building Code by Aug. 1, 2020. During the implementation period, the Department of Buildings will continue to work with a wide range of stakeholders to ensure a smooth transition. The code modernization will not increase permit fees. The full ordinance will be available on the City Clerk’s website.